48 www.coalage.com November 2018 legally speaking Grading MSHAS's Performance After 2 Years by brian hendrix Almost two years in- to President Don- ald Trump's first term, how would you grade the Mine Safety and Health A d m i n i s t r a t i o n's (MSHA) perform- ance? Is MSHA more effective or ef- ficient? No doubt, our nation's mines have never been safer. Fatality and injury and illness rates remain at record lows. Those are the metrics that matter the most to everyone in the mining indus- try. We can debate the amount of credit MSHA deserves for that, but most would agree that MSHA deserves a share. We can all agree that much can and should be done to improve MSHA's performance. Updating obsolete reg- ulations, eliminating burdensome or unnecessary regulations, and stopping the promulgation of new, unnecessary regulations would be welcomed. Regu- lating just to regulate help no one other than the regulators, and this adminis- tration seems to understand that. So far, the administration hasn't added to these problems, but it hasn't fixed them. In short, it inherited a large mess, and now it needs to get on with cleaning up what's accumulated over the years. MSHA could've started with belt air. The belt air debate should have been over a long time ago. We all understand the conditions under which the use of belt air is both safe and smart. Belt air can provide positive ventilation, improve dust control, and more effectively dilute and carry away methane. Flame-resistant conveyor belts, atmospheric monitoring and other technological developments have drastically reduced the potential risks associated with belt fires. 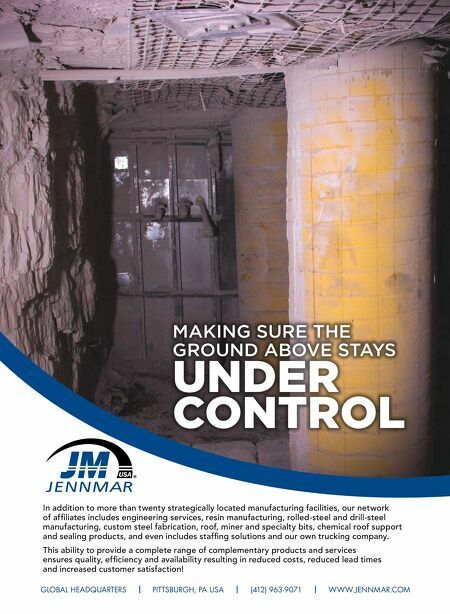 MSHA knows and has known this for years. In 2008, it amended 30 C.F.R. § 75.350(b) to permit the use of belt air. Yet it is still nearly impossible to get approval for any ventilation plan that includes belt air. MSHA's Plan Approval Process is still broken. At its best, the process is slow and inefficient. At its worst, it is puni- tive, arbitrary and capricious. Too often, it is at its worst. Pet theories — personal opinions — about how best to ventilate a mine or support a roof often trump ob- jective, mine-specific, evidence-based approaches proposed by operators. Dis- trict managers hold all the cards. Mine operators can't run without MSHA's approval, and operators who question or challenge a district's demands, often stated but rarely reduced to writing, can find themselves in a tough spot. Opera- tors also know how difficult, time-con- suming and expensive it is to obtain meaningful review of plan decisions from Arlington or the commission. The problems with MSHA's plan ap- proval process are internal. They are cul- tural, institutional and bureaucratic, not legal. They can be fixed by MSHA and this administration. MSHA doesn't need Congressional approval or a new regula- tion to do what needs to be done. MSHA's process for Petitions for Modifications under Section 101(c) suffers from many of the same prob- lems. Most of MSHA's regulations were promulgated 40-plus years ago. Mining has changed over the last half-century. Technological innovations, new equip- ment, new methods, etc., abound. 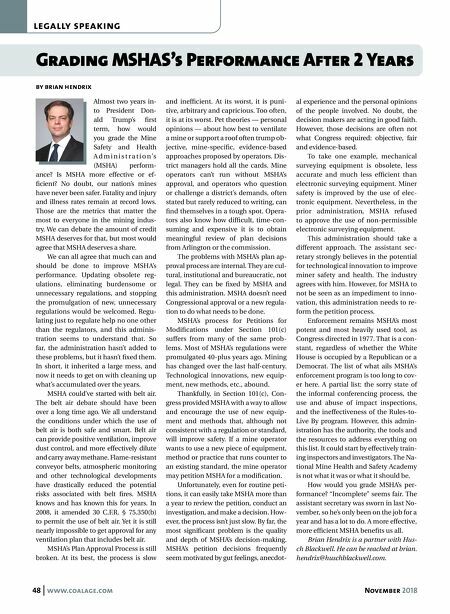 Thankfully, in Section 101(c), Con- gress provided MSHA with a way to allow and encourage the use of new equip- ment and methods that, although not consistent with a regulation or standard, will improve safety. If a mine operator wants to use a new piece of equipment, method or practice that runs counter to an existing standard, the mine operator may petition MSHA for a modification. Unfortunately, even for routine peti- tions, it can easily take MSHA more than a year to review the petition, conduct an investigation, and make a decision. How- ever, the process isn't just slow. By far, the most significant problem is the quality and depth of MSHA's decision-making. MSHA's petition decisions frequently seem motivated by gut feelings, anecdot- al experience and the personal opinions of the people involved. No doubt, the decision makers are acting in good faith. However, those decisions are often not what Congress required: objective, fair and evidence-based. To take one example, mechanical surveying equipment is obsolete, less accurate and much less efficient than electronic surveying equipment. Miner safety is improved by the use of elec- tronic equipment. Nevertheless, in the prior administration, MSHA refused to approve the use of non-permissible electronic surveying equipment. This administration should take a different approach. The assistant sec- retary strongly believes in the potential for technological innovation to improve miner safety and health. The industry agrees with him. However, for MSHA to not be seen as an impediment to inno- vation, this administration needs to re- form the petition process. Enforcement remains MSHA's most potent and most heavily used tool, as Congress directed in 1977. That is a con- stant, regardless of whether the White House is occupied by a Republican or a Democrat. The list of what ails MSHA's enforcement program is too long to cov- er here. A partial list: the sorry state of the informal conferencing process, the use and abuse of impact inspections, and the ineffectiveness of the Rules-to- Live By program. However, this admin- istration has the authority, the tools and the resources to address everything on this list. It could start by effectively train- ing inspectors and investigators. The Na- tional Mine Health and Safety Academy is not what it was or what it should be. How would you grade MSHA's per- formance? "Incomplete" seems fair. The assistant secretary was sworn in last No- vember, so he's only been on the job for a year and has a lot to do. A more effective, more efficient MSHA benefits us all. Brian Hendrix is a partner with Hus- ch Blackwell. He can be reached at brian. hendrix@huschblackwell.com.